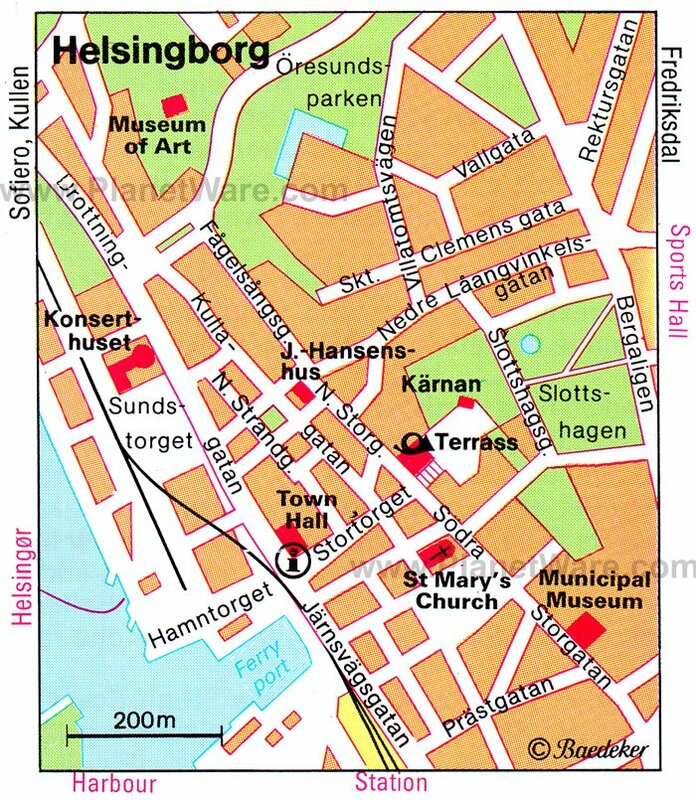 Helsingborg, strategically situated at the narrowest part of the Oresund strait and opposite the Danish town of Helsingor (Elsinore), was for centuries hotly disputed between Denmark and Sweden. It's now a busy port, commercial and industrial town, a favored center for conferences and trade fairs, and Sweden's main channel of communication by sea with Denmark and mainland Europe. The port has been somewhat eclipsed since the building of Oresund Bridge, which links Sweden and Denmark, but is still worth exploring. The historic town has many attractions, including old houses, stone churches, narrow alleyways to wander through, and the Kärnan fortress, which has guarded the town for more than six centuries. Helsingborg is also known for its lively dining scene, and its many restaurants serve everything from Asian and European cuisine to scrumptious Swedish specialties. Immediately apparent to tourists arriving by sea is the town's emblem and landmark, Kärnan (the "Kernel"), a conspicuous brick tower 35 meters high, which stands at the upper end of the long market square (Stortorget). At the end of the square, two towers frame a broad flight of steps that lead up to Konung Oscar II's Terrass, where the old defensive tower stands. In 1400, it was the central feature of a stronghold built on the site of an earlier timber fortress, probably dating from the 10th century. The castle was destroyed in 1680, leaving only the tower standing. From the top (190 steps) you can enjoy superb views of the town and over the Oresund to Denmark. Beyond Kärnan is Slottshagen, a beautiful park with a sculpture by Christian Eriksson, The Hunt, as well as the remains of the old fortress. This is a must-see attraction for all the family and a journey back through the centuries. You can stroll around and experience a real working Skåne farm, old countryside houses and outbuildings, an outdoor theater, the old 18th-century Fredriksdal Mansion, a Music Museum, a Botanic Garden, Grafiska Print Museum, and an open-air theater. Kids will love all the farm animals, and at the old town quarter, you can buy quaint sweets or roses in the flower shop. In essence, Fredriksdal is the rural Skåne of old, spread across 360,000 square meters of an utterly unique setting. About five kilometers north of Helsingborg, Sofiero Castle lies in one of Europe's most beautiful parks, boasting a truly regal history. It was once a summer getaway for Swedish royalty. In the spring and summer, the flower and kitchen gardens are simply magnificent, and you can enjoy informative exhibitions and a variety of exciting events and activities here. The castle holds particular appeal for children as they can take part in activities such as gardening and storytelling. Imaginative and safe play areas are on hand for all ages, and colorful blooms, such as rhododendrons and dahlias, provide beautiful photo opportunities. Visiting this wonderful indoor zoo is one of the most popular things to do in Helsingborg for animal lovers and families with children. Its relatively nondescript exterior belies the fun adventures that await inside. Lemurs, monkeys, meerkats, bats, and birds are just some of the creatures in this recreated tropical rainforest, and a small aquarium displays sharks and a coral reef. Unlike many other zoos, the exhibits here have few barriers; bats and birds fly freely around, and for an extra fee, you can hold a snake or crocodile, touch a shark, or feed a lemur. Rain or shine, this fun attraction allows you to immerse yourself in another world. After all your animal adventures, stop by Café Masai Mara for refreshments and snacks. Filled with art galleries and special exhibitions, the Kulturhuset hosts international music, theater, dance, and cultural activities for young people. Inside is a restaurant, bistro, and the Helsingborg Tourist Information Center, so this is a good place to stock up on information about the town and area. A multimedia exhibit provides an interesting overview of the town's history, and in the Reading Room you can browse through journals and books on diverse topics, including theater, music, history, art, archaeology, architecture, and film. The restaurant offers great views out over Öresund. Interestingly, the building was designed by Danish architect Kim Utzon, son of Jörn Utzon, who designed the iconic Sydney Opera House. The pretty Gothic church of St. Mary is one of Helsingborg's oldest buildings. It dates from the 12th century, when it was built in the Romanesque style, and was renovated in the 15th century in Gothic style. Swedish places of worship are noted for their simplicity both internally and externally, however notable features of the interior here are the elaborate reredos (c. 1450); the pulpit dating from 1615, with intarsia decoration; a historical chart from AD 900 to modern times; and the beautiful stained glass. Helsingborg lies only four kilometers across the Øresund strait from the medieval Danish city of Helsingor, so it's easy to squeeze a day trip to Denmark into your itinerary. You can take your car on the ferry or travel on foot, and the total journey is only about 20 minutes. One you arrive, don't miss the mighty Kronborg, best known as Hamlet's Elsinore Castle and now a UNESCO World Heritage Site. Also take time to explore the labyrinth of cobblestone streets and half-timbered houses in the medieval quarter, and stop by the well-preserved Carmelite Monastery (Karmeliterklostret) attached to St. Mary's Church (Sankt Mariæ Kirke). Between Drottninggatan and Kungsgatan, you'll find the Concert Hall (Konserthuset), designed by Sven Markelius in 1932. The building is one of the finest examples of Swedish functionalism and has been declared a historic structure. The hall is known for its particularly fine acoustics and is home to the Helsingborg Symphony Orchestra (HSO). Lovers of classical music should check out the varied program on offer. Located in the old town quarter of Fredriksdal Open-Air Museum, Grafiska is the largest working print museum in Scandinavia. This is a sure-fire stop on a tour of Helsingborg for lovers of the printed word. Inaugurated in 1995, the museum's mission is to preserve the proud craft and history of printing in the Skåne area. More than 50 volunteers demonstrate the workings of printing presses dating back hundreds of years. Most of Helsingborg's hotels are mid-range properties clustered around the city center near many of the top attractions, and this is the most convenient place to stay. The best options here include the pet-friendly, boutique V Hotel Helsingborg, BW PREMIER Collection, a short stroll from the ferry terminal and Dunkers Kulturhus, where the hip decor contrasts with the hotel's elegant, old building. Rooms come in different sizes. Steps away, Elite Hotel Mollberg has a more traditional feel, as does the neighboring Clarion Grand Hotel. A little farther out from the city center, but still only a ten-minute walk away, the new Radisson Blu Metropol Hotel offers fresh, stylish rooms. All these hotels include breakfast. If you're watching your wallet, the Miatorp Hostel has more affordable rates but it's a ten-minute drive from the city center. A mere four kilometers across the Oresund strait from the Danish city of Helsingor, Helsingborg is not the only Swedish city close to its European neighbor. About 65 kilometers south lies multicultural Malmö, where the iconic Oresund Bridge connects Sweden to Denmark. North of Malmö, Gothenburg is also relatively close to Denmark and has a distinctly European feel. Any trip to Sweden should also include a visit to the beautiful capital, Stockholm, often called "the Venice of the North" thanks to its many waterways. From here, you can explore some exciting destinations in the surrounding countryside on fun day trips, including the medieval university town of Uppsala. Only a 35-minute flight away from Stockholm, the beautiful island of Gotland attracts many vacationing Swedes and international visitors alike.